FORWARD OPERATING BASE SPIN BOLDAK, Afghanistan (11/28/2011) – Country music artist Aaron Tippin first entertained troops during the Gulf War when he traveled with Bob Hope to Saudi Arabia. Pfc. 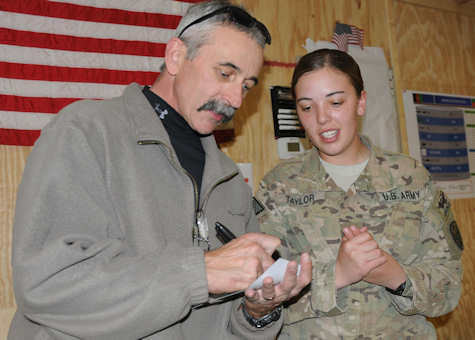 Natascha Taylor, of Colorado Springs, Colo., currently deployed to Afghanistan with the 504th Battlefield Surveillance Brigade, gets an autograph from country music artist Aaron Tippin Nov. 27, 2011 at Forward Operating Base Spin Boldak, Afghanistan. Deployed in support of Operation Enduring Freedom, Taylor and the soldiers of the 504th BfSB are often without entertainment during the holiday season. Photo by Army Sgt. Marc Loi Since Sept. 11, 2001, the singer/songwriter has been an integral part of the military with multiple trips to Iraq and Afghanistan to entertain troops. He most recently performed at Forward Operating Base Spin Boldak, just 7 miles north of the Pakistan border, Nov. 27 and sat down to talk about America at war, Osama bin Laden and Kandahar Airfield's infamous Poo Pond. Q: You were here in 2006, and visited Kandahar Airfield. Has the Poo Pond improved since? A: (laughing) Actually, it wasn't that bad when I was there the last time. So, I guess as the population increased, so has the brown Poo Pond. Q: A lot of people describe your music as blue-collar country. Is this fair? Americans. That's what my music is about. Q: Talk about the connection between the country music industry and the military. Why are there so many of you coming out here? A: Somebody with a bigger calculator than me will probably have to figure that out. But I know a lot of guys and gals from Nashville would love to be out here with you. The country music industry is mighty pro-military. We've got guys like Craig Morgan – an ex-Ranger, Darryl Worley, Neal McCoy – there's a ton of guys and gals who love the troops. I don't know why that is, but I am proud of them. Q: One of your first hits was “You've Got to Stand for Something.” What do you stand for? A: I stand for the military, how about that? You can go out there and say you support the war, but to prove you're behind what you send the military to do is something else. The folks that I play for – the Aaron Tippin fans back home, they can't come out here and see what the troops do, and I wish that they could so they see the troops at their best. I am bringing the commitment and appreciation from them. Q: What about the military – what does it stand for? A: Our freedom is based entirely on the power of our military forces. The world respects us for that. Around the world, it means if somebody wants to be free, we'll come help them. Q: This is something you've done for a better part of a decade. Have you seen improvements here? A: Absolutely. I remember when I was here in '06, landing in Kabul, and everything was lined with sandbags, and I could see snipers laying on the rooftops because the enemies were shooting into the airfield, and that's changed considerably. Q: A few days after Sept. 11, 2001, you went to your label and made the song “Where the Stars and Stripes and the Eagle Fly.” What was the thinking behind that? A: I was proud to have the song already. It was cool to have a song I could send out to the American people and have a helping hand in uniting our country. Q: Where were you when you heard that Osama bin Laden had been killed? A: We were on the road in California, and I heard it on the news. I thought if it was really true – at that time it was just rumor, then it was a great day. I think he was the reason this all started. It was a crown jewel to get that guy because our mission was to come get him and bringing him to justice. I wish it had come a little faster, but it was great news. Accomplishing this goal – we just can't say “okay, we got what we came for, let's get out of here.” A lot of things have to be done. We've befriended a lot of people in this country. To walk off and leave those guys behind isn't right. Q: In your years of entertaining the troops, what are some stories that have stood out? A: Out here I don't hear as much as when I get back home. I've been in autograph lines back home and at the end of the night someone would walk up and say they were in Kandahar or wherever and would flip out a picture and say, “This is me and you.” Man, that's a blessed moment for two reasons: I get a chance to remember that moment when I was with them, and I am seeing them alive and in person in a safe zone. That's a good feeling. Q: Do you think there will be a day when you won't have to come here anymore? A: I sure as hell hope so. I hope there is a day when there are no soldiers deployed and being put in harm's way. The older I get, the more I pray for that. I realize war is a necessary evil, but I pray that day comes.